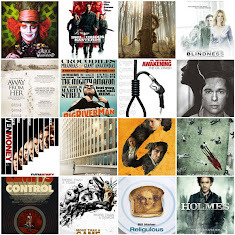 As a race, we humans are obsessed with the notion of "best." Whether it's generations of on-point marketing or a strand of latent genetic code that pushes us to shack up with a better mate, we just can't shake the disposition. 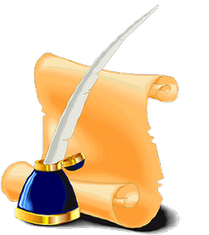 It's what drives our society forward – the quest for the latest product that promises a slightly improved experience or that one feature that eclipses the competition. It's why we can happily saunter up to the feeding trough at the local buffet instead of poking at wild boars with pointy sticks. It is, simply put, a good thing. The domestic full-size truck segment provides perhaps the greatest study in "best" available. Each new model year gives the Big Three one more shot at outdoing each other in the areas of power, towing capacity, interior room and fuel economy. Neither Ford, General Motors nor Chrysler skips the chance to brag about its latest advancements over the other two. But as with everything, there can be only true king. In this feudal system, it's Ford F-150, which has attracted more buyers than the Chevrolet Silverado, GMC Sierra and Ram 1500 for years. Why? 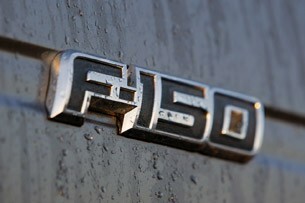 We took to the saddle of Ford's latest entry-level F-Series equipped with the company's new 5.0-liter V8 to find out. Ford hasn't pulled any punches over the past 24 months. With General Motors and Chrysler both in the throes of significant corporate overhauls, the Blue Oval has unleashed a torrent of product updates that have included fresh styling, well-executed interiors and drivetrains that deliver both power and efficiency with little compromise. 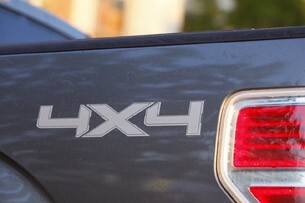 The F-150 hasn't missed out on any of that mid-cycle love thanks to four brand-new engine options, though the vehicle's exterior has remained largely untouched compared to the 2010 model. Ford shouldn't take that as a slight, however. 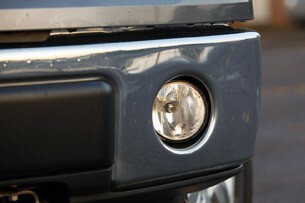 The pickup received a slight fascia update just last year, and the grille, headlights and bumper still look fresh up front. The F-150 may be much less in-your-face than the Ram 1500, but its nose seems more vertical and muscular than the squat lines of the Silverado. 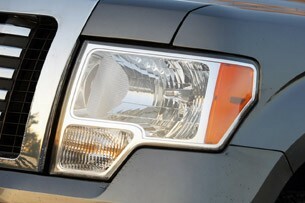 We aren't overly smitten with the squared-off grille and similarly angular headlights, but the treatment lends a dose of Super Duty presence to the half-ton pickup. Our tester came in SuperCrew configuration with a 145-inch wheelbase and an optional $1,600 chrome package, which threw in California cowboy treatments like flashy step bars, tow loops and 18-inch wheels. As much as we'd like to scoff at those step-bars, the truth is that unless you're directly related to Kareem Abdul-Jabbar, you'll to need them to get inside. With a floor-height of around 24 inches, ingress is an exercise in mountaineering. Around back, our tester came packing a short box with a total length of just over 66 inches – not nearly as large as the optional eight-foot bed, but more than adequate for light-duty tasks like hauling gravel or other landscaping goodies. 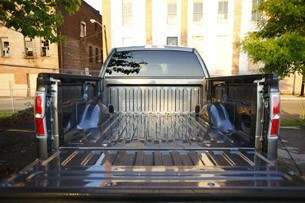 Like most full-size trucks, the 2011 F-150 uses extremely tall bed rails that make it impossible for an average-sized adult to reach objects in the bed. At around 57 inches from the ground, the rails land at arm-pit level on the typical adult, rendering limbs all but useless to leverage grocery bags from inside. If you want to transport small items in the bed, be prepared to drop the tail gate or climb the tire to rescue them from their fortifications. Still, that height isn't simply designed to help give the F-150 an imposing stance, though that's certainly a byproduct of the design. Instead, the extra lift minimizes wheel well intrusion into the box. As a result, there's more cubic volume to be had for loads of loose materials than if the bed sat lower on the frame. 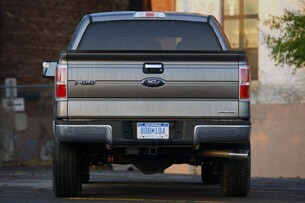 Ford has also included four heavy-duty tie downs that are sturdy enough to take the abuse of a ratchet strap. That's a good thing since the bed rails are incredibly thin and trimmed in plastic. Despite the gentrified exterior accouterments, the interior remained appropriately utilitarian. We were treated to cloth captain's buckets up front with a cavernous center console. If you were struck with the notion, you could easily house two one-gallon milk jugs inside. The driver is met by an excellent multi-function steering wheel with a faux-leather wrapped appearance. The tiller feels suitably meaty and durable for a vehicle of this size. 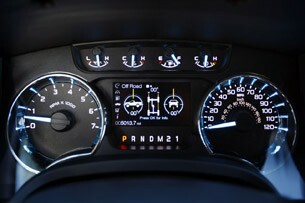 Like other Ford products, the steering wheel also features a new five-way button for controlling a small, high-resolution LCD screen nestled between the tachometer and speedometer. Though somewhat distracting to navigate while in motion, the categories are logically assembled and provide information on fuel economy, vehicle systems and even pitch and yaw for your off-roading excursions. Needless to say, that last screen was our favorite. 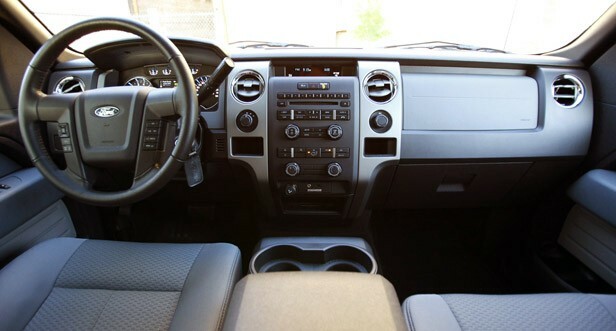 Meanwhile, the dash is laid in well-grained, dual-tone plastic accented by chrome-bezel air vents. The center stack offers two cubbies sized for either a mobile phone or an MP3 player, which we found more accommodating than the usually lauded SYNC system. Despite our best efforts, the audio system refused to acknowledge our iPod and would only occasionally play music from a thumb drive. The good news is that when the technology decided to cooperate, the 2011 F-150 didn't disappoint in the sound quality department. Thanks to our SuperCrew cab, rear passengers were afforded an impressive amount of space. There's easily enough leg, head and hip room for three corn-fed boys out back. Even better, the rear bench stows quickly with the lift of two under-seat paddles to provide a huge interior cargo space. With 31 inches between the front console and the bottom of the folded seats, and 57 inches from door to door, there's ample room for Ikea boxes or a large flat-screen television. It's simply impressive. What's more, the flat floor is perfect for safely transporting long guns under the rear bench while still ferrying passengers around. 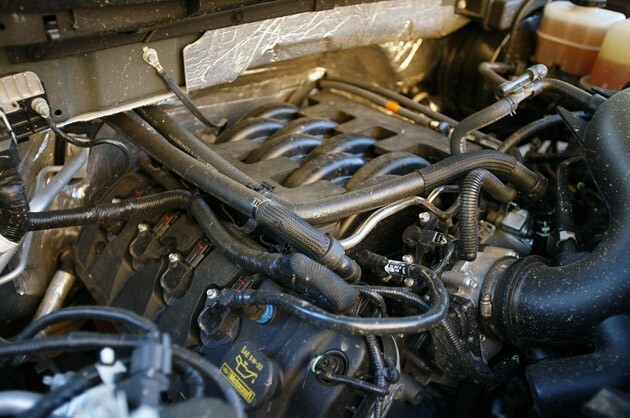 Ford threw the engineering gauntlet down on the 2011 F-150 drivetrain, and as a result, buyers can have the truck with a range of new engine options. Ford offers a slew of powertrains for the F-150 depending on trim, including a new twin-turbo EcoBoost 3.5-liter V6, a naturally-aspirated 3.7-liter V6 and a more muscular 6.2-liter V8. Our tester came packing the line-up's middle child – a new 5.0-liter V8 engine with 360 horsepower and 380 pound-feet of torque coupled to a six-speed automatic gearbox. A two-speed transfer case with electronic shift-on-the-fly control handles four-wheel-drive duties, too. Despite being only the second-most powerful engine choice on the option sheet, the twin-overhead cam V8 makes for an impressively quick truck. While perfectly content to burble around in the lower registers of the tachometer, quick right-foot thrusts will yield giggle-inducing propulsion. 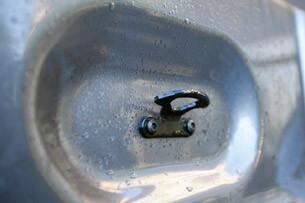 At the same time, the engineers at Ford have managed to also squeeze respectable fuel economy out of the engine. According to the Environmental Protection Agency, our tester is good for 14 miles per gallon in the city and 19 mpg on the highway. We managed 15.4 mpg during our time with the truck; just below the combined estimate of 16 mpg. In a world increasingly awash with crossovers and neutered capability, the F-150 provides a refreshingly traditional driving experience. At no point are you under the impression that you're piloting anything other than a legitimate pickup. With its tall ride height, the vehicle affords plenty of visibility, and the dish-plate-sized sideview mirrors make for easy lane changes. 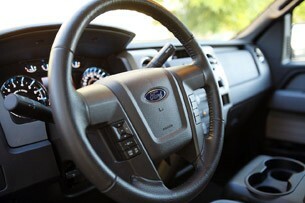 Ford did an excellent job of properly weighting the electronic power-assisted steering as well. Low speed maneuvers are handled with just the right amount of assist, even in four-wheel drive. That's impressive given that our tester wore sizable 275/65/R18 Goodyear Wrangler rubber at all four corners. 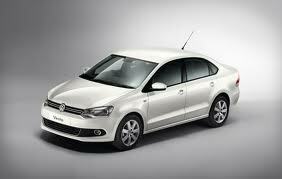 On the road, the steering avoids feeling overly light even at highway speeds. Additionally, the column-mounted shifter is a well-thought out piece that allows for quick and easy gear changes from Drive to Reverse and back again, something that's essential for properly positioning a trailer or negotiating this big rig into tight spots off road. The shifter is built with additional resistance between Park and Reverse, which means the driver can simply lift the shifter to back up without having to lower his or her eyes from the task at hand. We approve. The shift-on-the-fly four-wheel drive is as simple to operate as flicking the dial on the dash from 4x2 to 4x4, though if you want to drop into low range you'll need to slide the transmission into Neutral. 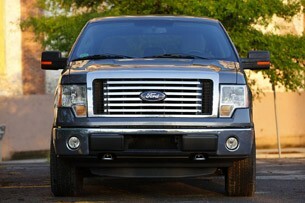 When you aren't creeping around your front yard in low-range, the 2011 F-150 is fairly mild-mannered on the road. With an empty bed, the truck feels characteristically buckboard, though with comfortable seats and an effective cruising range of 684 miles, we could certainly survive a multi-tank road trip and still be able to walk afterwards. There's also surprisingly little road noise at highway speed, and while the stock exhaust sounds plenty throaty under hard acceleration, the back pipes are quiet under steady speed. We did notice that the F-150 is graced with an incredibly lax traction control system. This is about as far from an electronic nanny as you can get. Familiarize yourself with the skinny pedal, crank the steering wheel and get ready for some tail-wagging glory with an empty bed. It's exactly what you want to see from a V8-powered, rear-wheel-drive creation, though we have to imagine the system would be a little less entertaining under wet skies and emergency acceleration. The good news is that should you get too frisky with the go pedal, the brakes will do a bang-up job of bringing things under control. 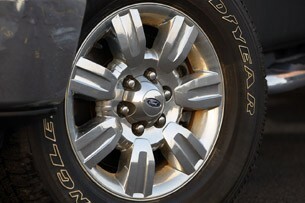 Ford built the F-150 with four-wheel ventilated disc brakes with 13.8-inch rotors, mashed by dual-piston calipers up front. The back axle is graced with 13.7-inch rotors held by single-piston calipers, and nose dive is kept to a minimum. Thanks to the power on hand, a stout boxed frame and an optional 3.73 rear-axle ratio, this particular variation of the F-150 brings a 9,300-pound tow rating to the table. We were unable to strap a trailer to the pickup while it was in our care, though we settled for the next best thing to determine how the 5.0-liter V8 stood up under a load. After a quick visit to the local nursery, we loaded the bed with a cubic yard of mulch. 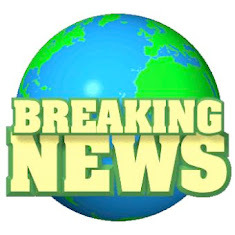 The material weighs in at around 800 pounds per yard, which is a little more than half the pickup's 1,487 pound cargo capacity. You can check out how the truck handled the loading process in the Shortcut below. The extra weight was barely perceptible on the road both in acceleration and braking, though the poundage did go a long way toward smoothing out the bumps brought about by the set of stiff rear springs. Still, the 5.0-liter V8 was happy to plug along in overdrive up a long grade without needing to drop a gear. 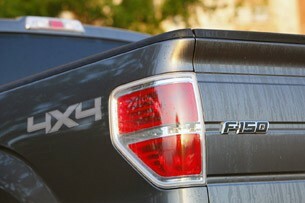 In fact, the 5.0-liter V8 would be the perfect engine for the 2011 F-150 if it weren't for one problem. In our configuration, the more powerful and efficient 3.5-liter EcoBoost V6 engine is just $750 more than the middle-weight V8. For that stack of cash, you're rewarded with five additional horsepower and 40 more pound-feet of torque. More importantly, that twist comes on a full 1,750 rpm sooner, while turning out one mpg more in both city and highway driving. 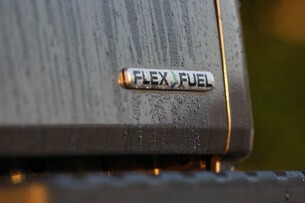 Our colleagues at AutoblogGreen even hypermiled an EcoBoost-equipped F-150 recently to over 30 mpg. It's hard to argue with more power and efficiency when combined with better delivery. So why does Ford even bother offering the less efficient, less powerful V8? Our guess is that the move has something to do with some truck buyers proclivity to always prefer V8 power. Also, adding the 5.0-liter V8 to the F-150 lineup likely helps defray the cost of the engine for the Mustang GT, which helps keep the pony car affordable. Good by us. 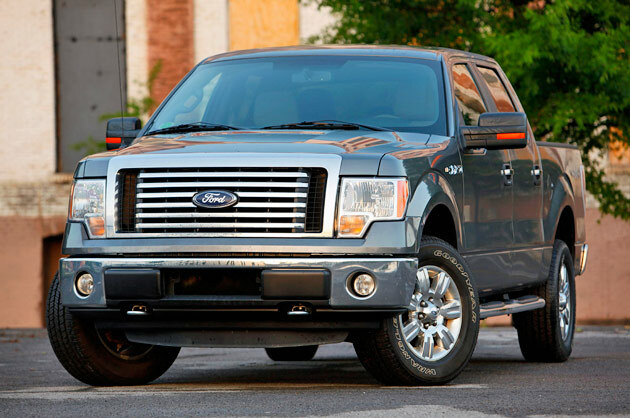 Our 2011 F-150 XLT 4x4 SuperCrew wore an MSRP of $38,965, which included extras like the 3.73 axle ratio, tow package, keyless entry and various aesthetic and convenience packages, as well as a $975 charge for destination and delivery. That's no small chunk of money, but considering that the SuperCrew cab allows this pickup to serve both as a family hauler and a work machine, we can begin to forgive the price tag. Ford will let you get out the door with a four-wheel-drive work truck under $30,000, but you can forget niceties like power equipment, cruise control and media management. 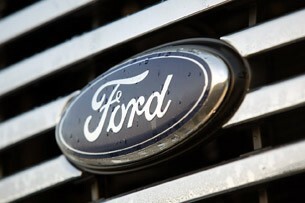 While General Motors and Chrysler have both stepped up their full-size truck efforts in serious ways over the past few years, it's easy to see why Ford still holds the sales title. 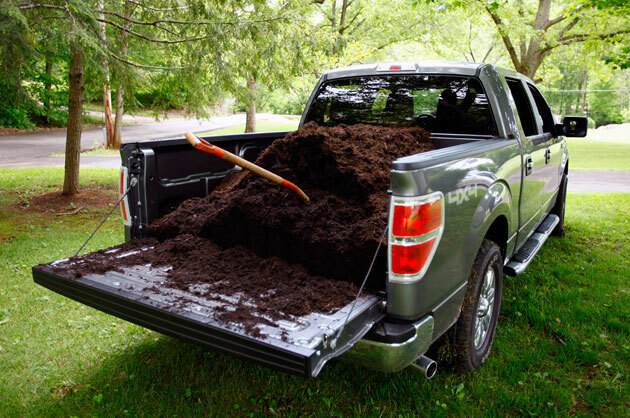 The F-150 is comfortable and tame enough to handle city traffic and mall parking lots with the family, and at the same time, it's also supremely capable of lugging a load of material back from the local co-op. It toes a fine line between civility and functionality and does it in an attractive, masculine package. All hail the king.